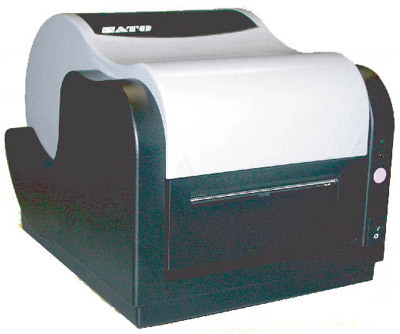 Sato CX400 RFID Desktop Printers are a low cost, low volume desktop printing labelling solution.Introducing SATO’s latest desktop printer in the "Compact" series - CX400. With a 32-Bit high-speed RISC processor, it allows for maximum throughput directly from standard Windows® applications as well as from SATO’s proprietary labelling software - SATO Label Gallery. Featuring a small footprint, it also has a 2MB internal Flash ROM and 2MB DRAM. Additional features include a maximum print speed of 4inch/sec and maximum printing length of 50inches (without any memory expansion). This new CX 400 also offers a flexible interface module - RS-232C and Centronics interface as a standard and optional interface modules include Ethernet (10/100Base T), 100Base-TX LAN adapter (via the parallel port) and USB adapter.The SATO CX400 not only boasts of a sleek look with its smooth lines but also of a sturdy chassis. Offering a superior print quality, the CX400 is more than perfect for low volume printing needs. Designed with "ease of usage" in mind, its wide loading compartment makes it easy for media loading (5"OD label roll can be loaded).